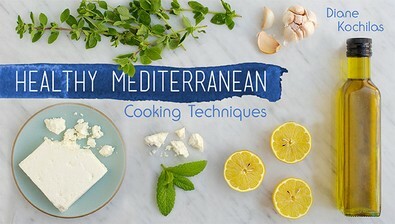 Master the methods behind Greek-Mediterranean cooking for your healthiest meals yet, with guidance from renowned cookbook author and chef Diane Kochilas. Learn how to build a Mediterranean flavor palate for marinades, pastes and dressings, with basic ingredients such as olive oil, citrus and herbs. Find out how to cook greens you'll crave in dishes such as tomato- braised sweet greens wrapped in flaky phyllo. Then, discover techniques for transforming vegetables like eggplant into rich spreads, dips and sauces. Next, kiss bland beans goodbye as you make a versatile flavor base packed with juicy plum tomatoes, sweet red onion and, of course, garlic! Finally, learn how to prepare, grill and roast lean meat and seafood for healthy and mouthwatering main course options that will have your family clamoring for more!